All Saints day is one of four Principal Feast days, commonly marked by the administration of baptism. Today (and this coming Sunday) we celebrate all those who are members of the Body of Christ, as we “express the intercommunion of the living and the dead in the Body of Christ” (Holy Women, Holy Men, p. 662). At St. Francis In-the-Field we will celebrate this Feast Day by lighting candles for loved ones who have died and placing them at the altar. We will also celebrate the baptism of one of our newest members – a three-month-old little girl. In some congregations we commemorate All Saints by singing the familiar hymn “I sing a song of the saints of God,” which often accompanies a procession of a number of folk dressed to represent a wide variety of gifts and the vocations through which they are expressed. It can be a little hokey, but I must admit I get choked up every time. Regardless of how you feel about that particular hymn, we could do with a regular reminder that each person in our midst – and all whom we encounter – has God-given gifts. God desires for each of us to identify and steward these gifts, to grow and flourish, to be productive and contributing members of the human race. On Sunday, our candles will be placed in wooden racks, lovingly designed and built by one of our parishioners. 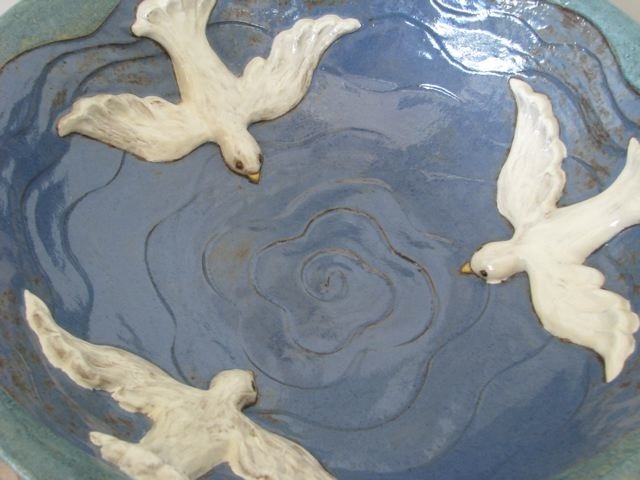 Our baptism will take place at the beautiful font pictured above and crafted by a parishioner. We are each recipients of God’s gifts and graces, and our job in life is to figure out how best to cultivate and share those gifts with our neighbors. Sometimes, though, we need a time of healing, a period for developing trust and a relationship with Christ and the church (the people). We aren’t all able to jump in right away. Sometimes we need to be able to put a toe in the water, to retreat for a time, and then to return and try again. Sometimes our journey to the threshold of Christian community is long and bumpy. We may need to rest along the way. That needs to be okay. Since coming to St Francis in June, I have been intrigued and delighted by a uniquely situated church pew. 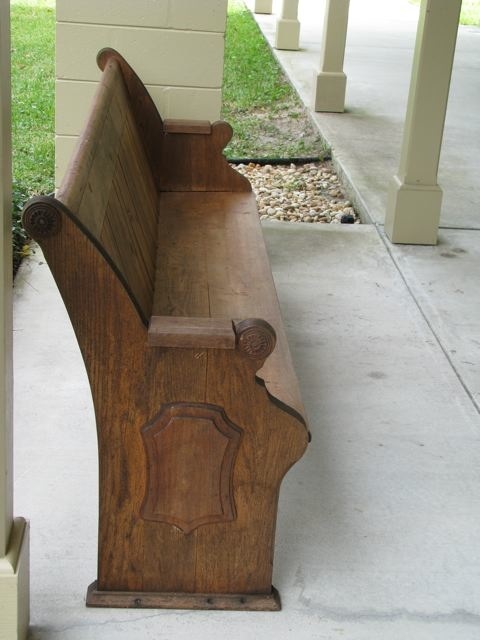 This pew does not sit in the sanctuary or even in the parish hall. It sits outside, providing a place to pause and rest in the sunshine and fresh air. At first I thought: This is too beautiful and valuable. It should be moved inside. But now I get it. Part of welcoming someone in is to allow them space to linger around the edges. This entry was posted in Diocese of Florida, Episcopal church, faith, peace and tagged 12-step spirituality, All Saints Day, holy ground, mercy, recovery, spiritual growth. Bookmark the permalink.